If you’re looking for somewhere to take the kids this summer, or if you’re just a big kid and want to live-out your Total Wipeout dreams, Florida’s largest inflatable water park can offer you hours of fun (although we can’t guarantee you’ll be any good at it…sorry). Don your bathing suit, tie up your hair and pinch your nose because this is going to be a wet and wild day out. The new aqua park is located at the Lift Adventure Park in Pasco County, Florida. As it’s just an hour drive from Tampa, an hour and a half from Clermont, two hours away from Orlando and two hours away from Sarasota, you can be having your day of fun in no time! If you’re coming by car, you will need to pay $5 to park in the car park, but it is so worth it. The aqua park is only one part of the Lift Adventure Park, meaning you can pack in even more fun into the mix. After your day out on the inflatables, you can have a go at wakeboarding, paddleboarding, kayaking – or you can just take a dip in the lake! Wakeboarding will cost you $20 for one hour and includes all of the equipment you could need. On top of this, kayaks and paddleboards will set you back just $10 for a 45-minute paddle. What more could you want? Oh, yeah! 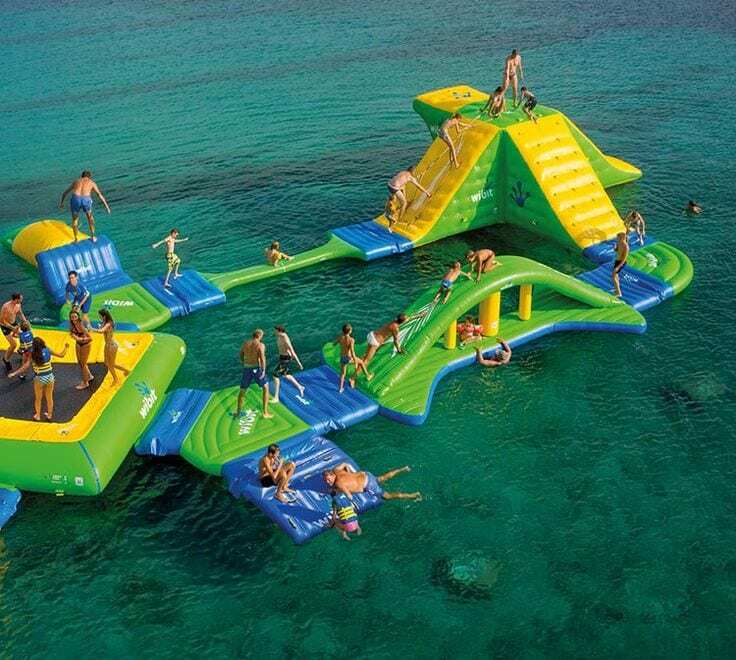 An awesome aqua park. 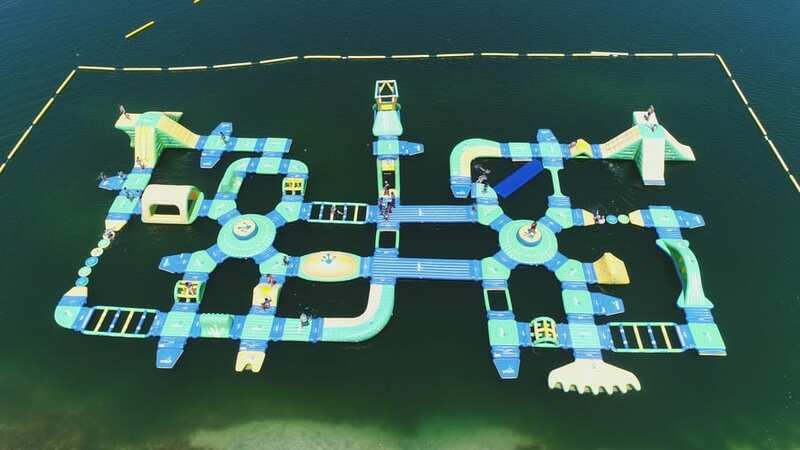 The Lift Adventure Aqua Park now rocks in as the largest aqua park in Pasco County, which means people from across Florida will be traveling to try out the giant water playground – and you could be next. With everything from slides, to inflatable climbing walls, to ladders, to swings, to trampolines, there is definitely enough to keep you busy. All participants will need to sign a waiver before getting on the inflatable aqua park (safety first, everyone!) and you can either borrow one of their life vests or bring your own to wear around the park. You will not be let on the aqua park without wearing one. 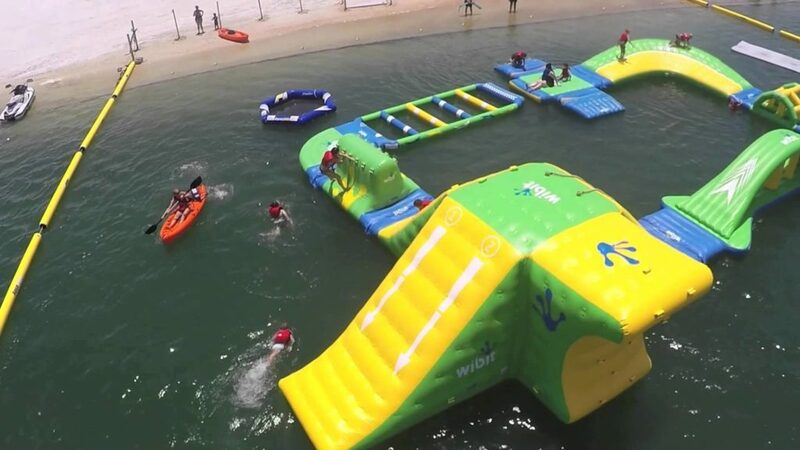 A 45-minute session on the Aqua Park will set you back just $10 – $15 (it will cost you $15 at the weekends), and it’s best to reserve your spot to avoid disappointment. You won’t regret it. Of course, like any kids playground or theme park-style adventure, there will always be restrictions that you need to know before you visit. If you’re thinking of taking small children to the Aqua Park – don’t! Due to safety requirements, users must be at least seven years old to use the Aqua Park, and at least 45 inches tall. Always measure your child’s height before booking. Because of the size, the aqua park can only hold a limited capacity of people. This is why we tell you to book!